Here's the "asterisk": Oh, by the way, because the system in question was tied to the AC mains, I needed some voltage isolation. Without isolation, a working solution would probably cost in the $200-$450 range. With isolation it probably pushes the cost an order of magnitude to $2000-$4500. There is always the possibility of pushing the isolation on the other side of the ADC: instead of analog isolation, using a non-isolated USB data acquisition system with an isolated USB adapter; that adds $50-$150 extra in cost... but all the signals in question would have to be referenced to about the same potential, and they aren't in this case. Analog isolation is a pain. There aren't many options; you can use one of these dual-feedback optoisolator modules like the Avago HCNR201 or the modulation/demodulation style like the TI ISO124. These are remarkably similar in specifications, and I'm not sure who came out with the first of these chips (probably Agilent with the HCPL-7560 before they spun off the former Hewlett-Packard optoelectronics division into Avago; since then Avago has changed the part numbering from HCPL to ACPL). You stick an analog 5V power supply on the isolated side, along with your input signal, and on the other side you power the IC and get a data stream output, along with either a clock recovery output or a clock input. From the viewpoint of designing them into a high-volume product, they're kind of expensive (compared to simpler ADCs which use successive approximation registers), at $3-$5 each in large quantities; for test instrumentation, at $6-$10 each in small quantities, they're a lot less expensive than other solutions. So what's a sigma-delta modulator? You've probably heard of sigma-delta analog-to-digital converters. These have been around for a while, especially in the above-16-bit market for ADCs. Historically they were used for very slow but very precise measurements: the classic application is strain gage digitization for weigh scales. Now you can buy 24-bit ADCs from several manufacturers and they have built-in 50/60Hz notch rejection. a filter, which takes the fast low-resolution ADC samples, and filters and decimates them to generate a lower speed stream of high-resolution ADC samples. The standalone ADCs do all this for you; you just treat them like a SPI peripheral to set up control registers and read back the high-resolution ADC data. I wouldn't be able to do justice to explaining the way these work in detail; for that, I would recommend a number of references (see the end of this blog article) but especially the MT022 tutorial on sigma-delta conversion from the legendary Analog Devices engineer Walt Kester, who has been at ADI since 1969. 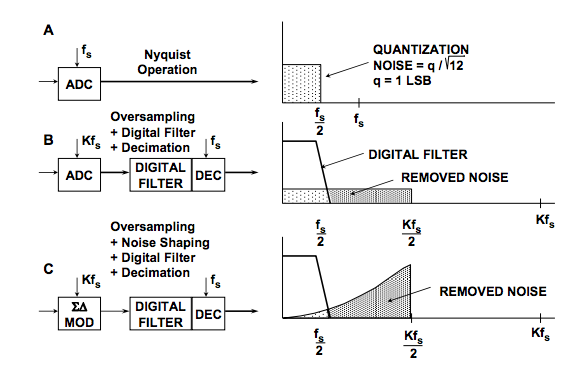 Here's the essence of the idea: Analog-to-digital conversion can be seen as conversion of a continuously-varying signal to one that has discrete levels, and this process can be viewed as adding quantization "noise" (the difference between the continuous input and the discrete-leveled output). Sigma-delta conversion pushes this noise "away" from the signal by both oversampling, where the quantization noise smears out over a larger spectrum, and "noise shaping", which biases the noise into the high-frequency portion of the data and keeps it mostly out of the low-frequency portion of the data -- which is where the signal you care about resides. Then the filtering part of the sigma-delta converter can remove the bulk of the quantization noise. If you want to know how it works to cause noise shaping, you'll have to read some of the references in detail and get into frequency-domain analysis and what-not. It's an integrating converter -- you don't sample the input at a particular instant; instead the input voltage continuously has an effect on the digitization. Here we get to the good parts. With a sampling ADC, you have to decide when to sample, and hope that your input doesn't have much noise around those sampling instants, and that it doesn't have much ripple content above the Nyquist frequency (half the sampling frequency) where it can fool the ADC into giving the wrong results. With a sigma-delta ADC, you don't really need to worry about that, for two reasons: one is that the ADC bit rate is so high that you can use a really cheap RC filter to get rid of ultra-high frequency content, and the other is that even if some high-frequency noise gets through, it will be averaged out by the input integrator. And if the sigma-delta clock rate is synchronized to a multiple of another system source, like a PWM signal or a current waveform with ripple at the PWM frequency, then you can get rid of this ripple altogether and read just the average value of the input. Which is great for power electronics. That's the good part of the integrator. 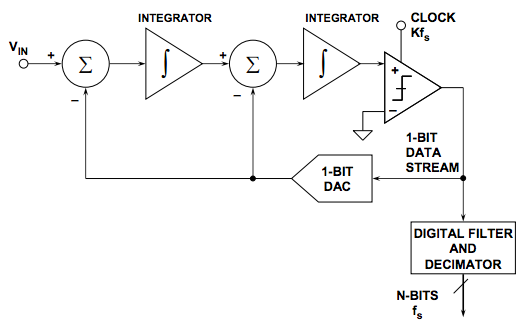 The fact that it's a 1-bit ADC which puts out a stream of digital bits, means we only need 1 digital isolation channel if we want to get the ADC across an isolation barrier, along with a 2nd channel for clock input or clock recovery, and we don't need to handle a SPI protocol (when combined with an isolation barrier, this means worrying about bit timing and round-trip latency and all that); the bits just come along and you deal with them one by one by one. So it's a no-brainer!.... except for one thing. How do you deal with a 10-20MHz stream of digital bits? I mean, come on, information overload! Well, here's the hard part, then. If you're doing real-time control, this is fast enough that you'd better be using a dedicated sigma-delta filter/decimator, or be good with FPGA programming. The theory behind filtering and downsampling is actually pretty easy. A lot of applications use 3rd-order sinc filters, also known as cascaded integrator-comb filters. These are great for digital applications. There's no multiplies involved, just adds, subtracts, and single-step delays. What I do wish, is that there were some data acquisition systems that took in sigma-delta bitstreams and handled the filtering/decimation and acquired the results into memory on your PC. Sigma-delta ADCs are nice, but it's much more powerful (and gives you the ability to use simple 1-bit digital isolation) when you can use a sigma-delta modulator and combine it with a separate filter/decimator that lets you choose what clock to use, how fast to oversample it, etc. 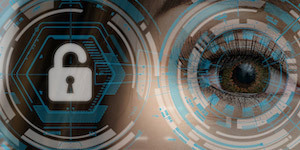 In any case, things have been improving over the years, and I look forward to one day being able to use sigma-delta converters not only for instrumentation, but for embedded control as well. p.s. I haven't forgotten about the second part of How to Estimate Encoder Velocity Without Making Stupid Mistakes, which will cover PLLs and observers; my life has been really busy lately, and to do this topic justice I probably won't get enough time to finish it until later this year. Stay tuned!